As I read somewhere: if you are stuck in a collapsed tunnel somewhere in Korea, Jung-Soo is the guy you want to be stuck with. Despite his poor fate of sitting in his Kia under millions of tons of rubble after the tunnel through which he was driving towards his daughters birthday party falls down on his roof, with little hope of rescue and a limited amount of water and birthday cake, his spirits remain high. After he finds another survivor with a dog, he happily (well, briefly hesitatingly) shares his water, and he surprisingly does not kill the dog for diving into the food supply. I would have. The dynamic between what’s happening below ground and above, with the head of the rescue operation trying hard against all odds to get to the buried victim, and with the Jung-Soo’s wife being positioned as a mostly silent conscience of the rescue, the film manages to sustain the level of suspension that is necessary to avoid the boredom that could have happened in a less skilled script. Towards the end, there is some plot convolution going on, but proper placement of humour and the pretty impressive cast serve to divert from this. 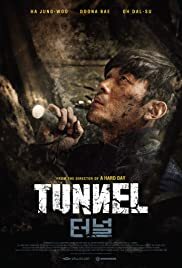 “The Tunnel” manages to keep the audience at the edge of their seats, and at least as far as I am concerned, I would not have placed any money on who is going to win this, Team Mountain in liaison with greedy suits and embarrassing politicians, or Team Kia, trying to dig a way out of this malaise.